The Energy Transition is becoming a fashion item! Painted fingernails are a popular adornment for women of all ages. Kirsten Hasberg announced the launch of her crowd-sourced venture EnergyDemocracy.TV at the Pathways to 100% Renewable Energy conference in San Francisco April 16, 2013. 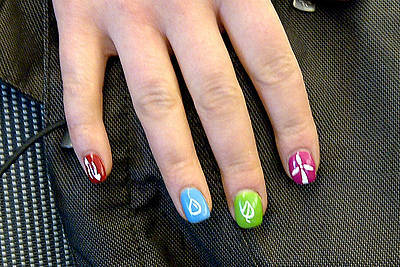 In doing so, Kirsten flashed her painted fingernails on which are the symbols of renewable energy technologies that make energy democracy possible, including one finger with the symbol for wind energy. The icons show the five basic sources of renewable energy: Sun, wind, biomass, water (=hydro and wave) and geothermal. 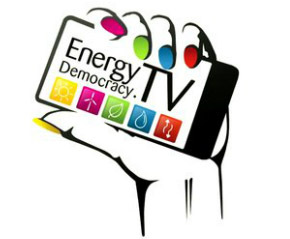 The logo for the concept of an app-based TV news on renewable energy is a symbol of a smart phone held up in a "power-to-the-people" pose with the symbols of renewable and the slogan the "transition to renewable energy is in your hands".